Should you be hurt while travelling, call this Fort Lauderdale Train Station/Bus Station Accident Lawyer today. Accidents happen in train stations and bus stations all of the time. Part of the reason for this is that there is so much activity/commotion in these places. People who may be late run around trying to catch their train or bus, and accidents can happen. If this occurs to you, you may be able to pursue a personal injury case. Accidents in train stations may also occur when people fall onto the tracks and are hit by oncoming trains. They may also include situations where train conductors fail to slow their trains in time to stop at the station and cause a crash/wreck as a result. Accidents in bus stations may include situations wherein bus drivers hit pedestrians at the bus station or people waiting for a bus. In a sovereign immunity case, there are certain restrictions and limitations that you will have to deal with. For example, in a sovereign immunity case, you will need to give the governmental entity six months notice before filing a lawsuit. Moreover, when you bring a sovereign immunity case, you will typically be limited to only $200,000 in compensation. That is, under normal circumstances, you won’t be able to recover anything more than $200,000 in a case against a governmental entity. The only exception to this would be if you were able to pass legislation/a bill in the State Legislature in Tallahassee called a “claims bill.” A claims bill can waive the sovereign immunity cap and allow you to recover more than $200,000 in compensation. Settlements with a governmental entity also may require approval by the governing-body of the governmental entity you settled with. For example, if you settled with the County, your settlement must typically be approved by the County Commission. Trains in Florida include the Brightline train, the Tri-Rail, the Metrorail, the Metromover, and the People-Mover/Monorail. Types of buses include City and County buses. They also include private, commercial bus carries such as Greyhound. Call Mr. Quackenbush at 954-448-7288 if you’ve been hurt in a train station or bus station anyplace in Florida (including Miami, Miami-Dade County, Palm Beach County, and West Palm Beach). 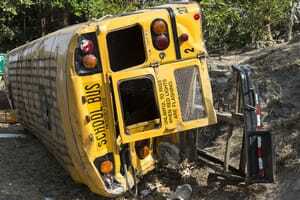 This Fort Lauderdale Train Station/Bus Station Accident Law Firm can help to get you the compensation you deserve. Mr. Quackenbush will talk to you about your case for free. Talk to Mr. Quackenbush today for free. He can help you if you’ve been injured in a train station or bus station anywhere in Broward County (including Coconut Creek, Cooper City, Coral Springs, Dania Beach, Davie, Deerfield Beach, Hallandale Beach, Hollywood, Lauderdale-by-the-Sea, Lauderdale Lakes, Lauderhill, Lighthouse Point, Margate, Miramar, North Lauderdale, Oakland Park, Parkland, Pembroke Pines, Plantation, Pompano Beach, Southwest Ranches, Sunrise, Tamarac, West Park, Weston and Wilton Manors). Reach Mr. Quackenbush by calling 954-448-7288.